Jackie Bastianon is the Nature Conservancy of Canada’s (NCC’s) communications intern for the Alberta region this summer. She is currently studying journalism at Carleton University in Ottawa and hopes to use her writing skills to compel people to care about the environment as much as she does. As I sit for a quick rest in a tall patch of grass on the Nature Conservancy of Canada's (NCC's) Ghost Horse Hills property in Alberta, I'm joined by property stewards Vera and Richard DeSmet, who take a seat beside me. We begin to talk about where we're from and where we'd like to go, and Vera and I agree that living by the ocean on Salt Spring Island would be sweet and idyllic, but Richard doesn't agree. He basks in a large patch of sunshine surrounded by the butterflies and fire-coloured lilies that occupy the rich green meadow and states that there's nowhere else he'd rather be. As I look around again, I have to admit he has a point: the property is absolutely stunning, with its rich variety of wild animals, native plants and beautiful lookout. It is located within Westlock Country and is close to the Halfmoon Lake Provincial Natural Area. Only an hour north of Edmonton, the property is filled with pristine native forest, grasslands and wetland habitat. After hearing the story of how Richard and Vera acquired the property and getting the chance to roam around this area, Richard's choice in picking this area over other enticing options doesn't come as a surprise. Richard explains that he grew up around Ghost Horse Hills and fell in love with this area and fought hard to get the property. He recounts that as a child he would pack a lunch on Friday night, spend the weekend roaming around the area on his horse and return home Sunday evening. These hills were his backyard as a child, so it has always had a special place in his heart. The road to securing this property wasn't easy: it previously belonged to another family for over 60 years. Richard says that they rarely came out to visit the property and lived very far away. Richard and his wife wanted to settle down on this land, so they reached out to the former landowners. Over the years, they tried repeatedly to convince the owners to sell, but the previous family was not serious about selling the land and would increase the price every time Richard asked about it. They had almost given up hope, but in 2006 their dream was finally realized. Richard and Vera got a call from the landowners offering to sell them the property. But, the price was too steep for them to afford. Looking for alternatives, Richard and Vera decided to look into conservation organizations that were working in the area. This is how they learned about NCC. Richard and Vera contacted NCC to ask them to buy the property, and NCC agreed. Later that year, NCC acquired the land. At Richard and Vera’s recommendation, NCC named the Rainbow Equitation Society, an organization that the DeSmets were the property stewards for. Richard says that he is very happy that NCC bought the property. This place isn't just special to Richard. According to an NCC baseline report, there are many unique plants and animals found in the area, which is now protected from future subdivision and development. Richard and Vera are also spreading their knowledge and passion for the natural world with school youth groups, through the Pioneer Trail North Foundation. 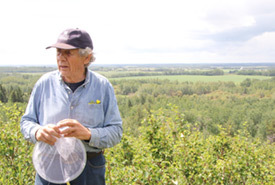 Some of the programs Richard and Vera are involved in include educational nature walks, fire building and responsible outdoor recreational programs. As Richard tells their story at the second butterfly catching Conservation Volunteers event held on the property in August, he emphasizes his appreciation for NCC’s staff members, particularly Carissa Wasyliw, who is responsible for managing this property. It's clear as I watch Vera and Richard carry their butterfly nets across their property, laughing and smiling as they interact with volunteers and staff alike, that this place is their home. Because they contacted NCC about conserving this magnificent property, they have helped ensure that this property will remain a safe place for many species for generations to come.